Toronto's Warren Barnes learnt a valuable lesson during his first try at the Worlds in Dubai yesterday, he's got to go at it from the get go. "Every swim counts here, and you have to attack it as if it were your last." said Barnes, who shaved close to six seconds off his personal best this morning in the Men's 200m Breaststroke. Barnes stormed off the blocks and never looked back, winning his heat with a time of 2:07.88. The time wasn't low enough to give Barnes a birth to the A Final (placing 15th over-all), but for him the experience was greatly beneficial. Congratulations go out to Warren on an extremely impressive swim in the Men's 200m Breaststroke. Not only did he set a lifetime best by over SIX seconds (amazing) but he also set the new Ontario Short Course Record. We could not be more proud! Going into the competition Barnes' previous personal best was a 2:13.42. Warren Barnes had today off. Up next will be the Men's 200m Breaststroke on Friday. On the first day of competition at the 10th FINA World Swimming Championships Warren competed in the Men's 100m Breaststroke setting a new lifetime best, and breaking the exclusive 1:00 barrier in the event. Entering the championships with a time of 1:00.58, Warren stopping the clock at 59.42 during Prelims, placing 23rd overall, and improving upon his previous LTB by over 1 full second. Breaking the 1:00 barrier was one of many goals entering the competition, and he was very pleased with the outcome. Warren has Thursday off, and will be back in the pool on Friday in the Men's 200m Breaststroke, followed by the Men's 50m Breaststroke on Saturday. Congratulations go out to Warren for making the cover of Canadian Swimming Magazine, Swim News back in August. Warren made the cover for his stellar performance at the 2010 Canadian Summer Nationals. We are very proud of him! Competition gets underway this Wednesday, December 15th in Dubai with Warren competing in the Men's 100m Breaststroke at the 10th FINA World Swimming Championships for Team Canada. As part of the lasting legacy of the 10th FINA World Swimming Championships (25m), the Dubai Municipality constructed a state of the art 15,000-seater multi-purpose sports venue. The Hamdan bin Mohammed bin Rashid Sports Complex - located on the Dubai Bypass Road. This exceptional venue will see some of the world’s best swimmers taking to the water this December. With a capacity of 10,000 for these Championships, this is set to be an event to remember on Dubai’s ever-growing sports calendar. This facility promises to be one of the largest and most technologically advanced in the world, boasting a 50m competition pool, a 25m dive pool, and a 50m warm up pool with a horseshoe-shaped seating bowl in the main arena. The size of the overall project is an impressive 24 hectares with the building itself occupying 56,031 square metres. 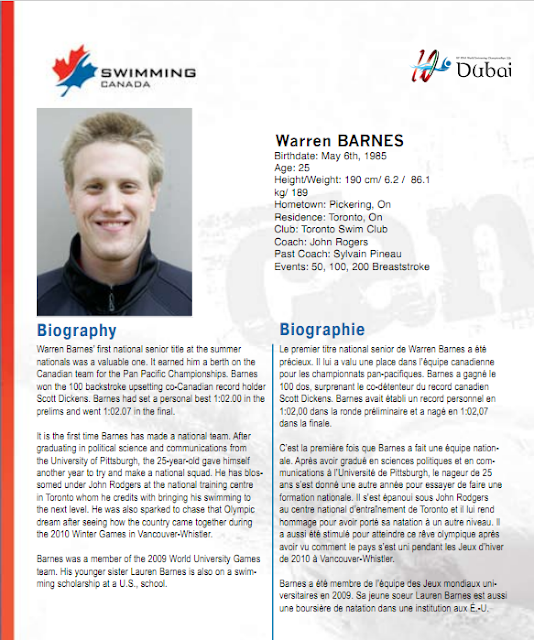 Warren Barnes is currently in Dubai, EUA for the World Short Course Championships with Team Canada. Warren will be competing in the Men's 50, 100, & 200m Breaststroke over the course of the competition. 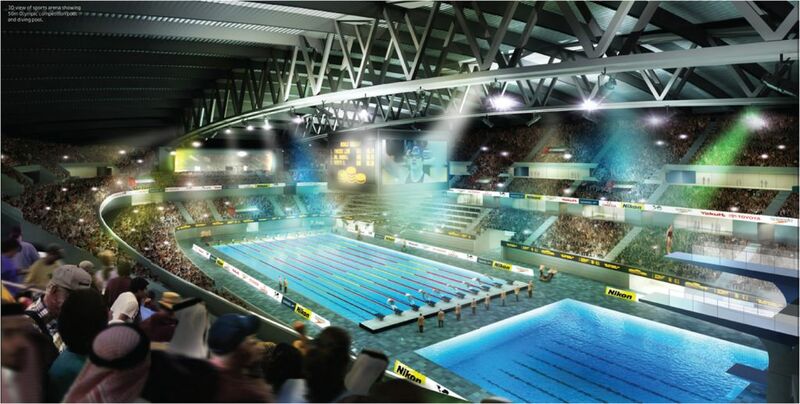 Dubai will stage the most competitive FINA World Swimming Championships (25m). The short course swimming championships have been held every two years since the inaugural championships began in 1993. Competition will begin on December 15th and run through December 19th. Over the five-days the World Swimming championships are expected to attract 30,000+ spectators, 1,000+ swimmers and 250+ media from over 140 countries. 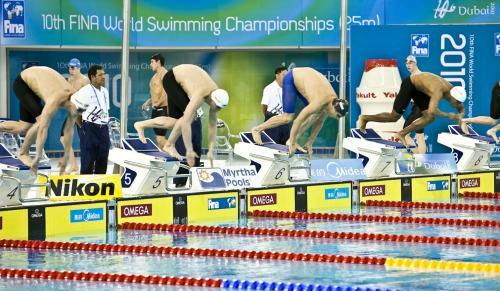 Dubai 2010 will be the first time that the FINA World Swimming Championships (25m) will be held in the Middle East. Each day of competition will be split into a morning and evening session. The morning sessions will be heats starting at 10:00am. Evening Sessions will be the Semi-Finals and Finals, starting at 7:00pm. Dubai is 9 hours ahead of EST. Congratulations to Warren Barnes on winning the Men's 50 Breaststroke at Canada Cup, breaking his own record in the event with a new time of 27.74. Warren also took bronze in the Men's 100 Breaststroke and 5th in the Men's 200 Breaststroke. Great job racing. 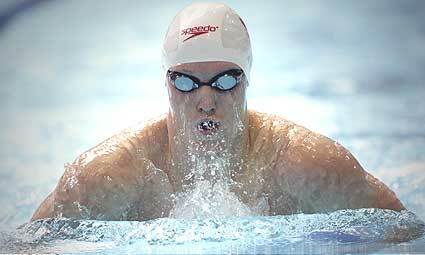 Up next, Warren will be traveling to Dubai with Team Canada for Short Course World Championships.